A DVD promoting mountain biking in the Central North Island has only been in the Australian market a month, but it is already receiving rave reviews and prompting Australians to plan trips across the ditch. "Mad If You Don't" is a 50 minute DVD that is included free with last month's edition of Australian Mountain Bike Magazine which has a circulation of 75,000. It follows the release of the popular "Be Rude Not To" DVD last year, and this time features the new Motu, Thermal and Taupo cycle trails, along with some of Rotorua's best mountain bike trails. The DVD was a Rotorua International Airport initiative in conjunction with a number of other partners including the Department of Conservation, Destination Rotorua Tourism Marketing, Events and Venues Rotorua, Tourism Eastland, Great Lake Taupō, Ride Rotorua, Rotorua District Council, Tourism New Zealand, Cycle Sport NZ, Trek Bicycles. Airport chief executive George White says mountain biking is a valuable tourist attraction for Rotorua and the wider Central North Island region, noticeable year round with Australians using the direct flights between Sydney and Rotorua. 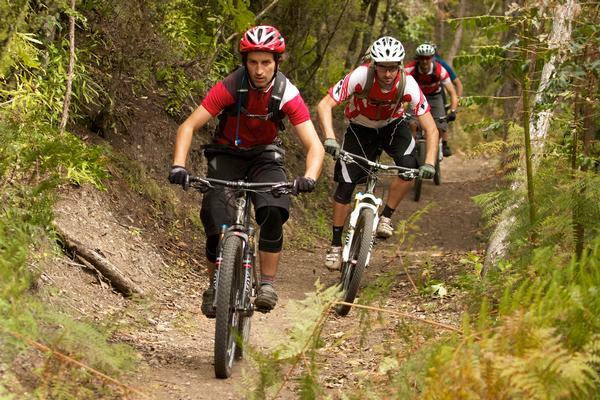 "Rotorua and the Central North Island region has a reputation as a cycling mecca. This area is renowned for its high quality mountain biking and road cycling opportunities and it has this reputation not just in New Zealand, but around the world - and we're lucky enough to have it right on our doorstep. "In Rotorua alone, recreational mountain biking is now worth more than $10.2 million - nearly double the income of local exports. A recent study indicates this worth will only increase with the launch of new trails and initiatives such as the national Cycle Trails and other promotions." He says this economic benefit made developing the DVD a win-win situation. Mountain bikers have already posted positive comments about the DVD on the magazine's Facebook page. "I just watched the latest DVD from your mag and it was....sweet. Those trials are....awesome." "What a brilliant issue! The DVD was fantastic and has me planning my first trip to NZ." "I've been watching your NZ DVD all weekend - LOVE IT. I would definitely be double figures from Start to Finish plus all the times I've just had it on whilst getting ready to ride." "Just picked up the mag from the newsagent, now back in the office I've watched the DVD trailer & just went from six to midnight ... my mate & I have been talking about riding NZ recently, but this DVD has sealed the deal - talk is no more, we are going!" Mr White says the airport experienced increased traffic following the release of last year's DVD, and he expects the region to see a similar response this time. Given the success of the two MTD DVDs, work is now starting on a new production promoting the walking trails of Rotorua and the wider Central North Island region.